Great pics! I hadn't heard the story of Galahs being released in 1922 before. Very interesting. 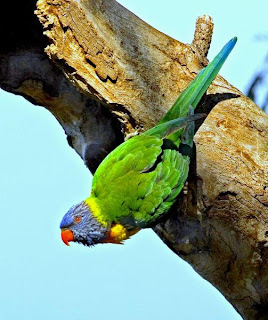 In Victoria, the Rainbow Lorikeets have spread naturally, from points further north because of humans planting gardens along the coast, providing a continuous all-seasons habitat. Add global warming into the mix, and you have the possibility of natural expansion of range of these birds. Galahs and Corellas have been greatly advantaged by clearing of forests to create farmlands, which provide food (grasses) where there was forest habitat before. Many birds, e.g., Magpies and Mudlarks, have been similarly advantaged by humans changing the landscape. Strong populations in coastal southern Victoria greatly increase the chance of natural experimental crossing of Bass Strait. Many small birds (e.g., Silvereyes and Robins) make the trip, so strong flying birds like parrots could surely make the trip. I agree about the threat posed by aggressive Rainbow Lorikeets to the Swift Parrots. Not sure if there is an answer, however. I have the release of Galahs on the "authority" of Michael Sharland (in his Tasmanian Birds). I should hasten to add that I don't have personal knowledge of the event! Thanks for your comments. I agree with your remarks about the possibility, if not likelihood, that expansion of the range of parrots is a likely cause of the present numbers. I am also aware that there were obviously feral corellas and Galahs about in southern Tasmania for some years before the more recent expansion. In the case of the rainbows, there is evidence of them being released locally. I see that fewer than 10 rainbows were released in the Perth area in the 60s, and there is a prediction that numbers will reach over 20,000 by 2010. It has been declared a pest in that state. There has been an attempt to limit corella numbers in the past (I briefly took part in that programme). Galahs are probably the most widespread of the "invaders", but seem to have had little impact on local species, but time will tell. I have no doubt that many species are capable of crossing Bass Strait, but apart from the usual migrants, few actually make it. Conversely, the abundant Green Rosella doesn't seem to make it to the Mainland, even from the islands. Global warming may well see the range southwards of many species, and Tasmania may be the "beneficiary", but I'm not quite sure how I feel about that! The decline in numbers of Swift Parrots is already a concern, without the possible competition, but, like you, I don't see an answer. I remember seeing some rainbow lorikeets in ulverstone about 5 years ago, ju8st a pair i think. Personally i could be convinced they made it to tassy themselves but i think if we want to give the swift parrot the best possible chance of a longterm existence then we should do what we can to eliminate the rainbow loris. Perhaps for no other reason than we will feel pretty silly when the lorikeets have reached critical mass, there is no hope ofcontrol and the swift parrot (which is marginalised already in so much of its lifecycle )drops off the extant perch. Of course there are many other things we should do for the swifties but i think its far better to "try and fail than not try at all". and i love your blog by the way! I think the source of the Rainbow Lorikeets or the corellas, is, in the end, somewhat irrelevant, and I'm certainly not in a position to judge. They're here. Their impact on our native species is of concern, particularly the rainbow/Swift Parrot issue, as you mentioned. I am sufficiently jaundiced to believe that either, nothing will be done (except monitoring), or there will be a prolonged study undertaken (with suitable major funding), and by its conclusion, it will have been overtaken by the reality of the problem and past fixing. I'm sorry if that seems unduly pessimistic! John Tongue sent me a story about rainbows in Ulverstone, where apparently there were about half dozen of them for some years. However, he mentioned recently seeing 32 in one tree alone. I appreciate your comments, Dave, and whole heartedly agree, that it would be better to try and fail, than not to try at all. I'm not holding my breath! Whilst at the Fort at Tinderbox yesterday, mecca of the Musk Lorikeet,I was pleased to briefly see a dozen or so Swift Parrots. Luckily I have yet to see any Corellas or Rainbow Lorikeets there.